I'll tell you a little secret. (It's not really a secret.) You can tell when I have finished a project at the last minute, because I'll be modelling it myself. That is definitely my last-resort backup option! It is almost the end of May, and I'm just squeezing in my Whimsy design for this month. For a little while (and possibly still), there seemed to be a lot of leopard print going around on the blogs I read, and it got into my brain, along with the quote I've used for my whimsy's title. I don't know if this quote is attributed to someone, but it is being used so much on the internet that I couldn't find out! 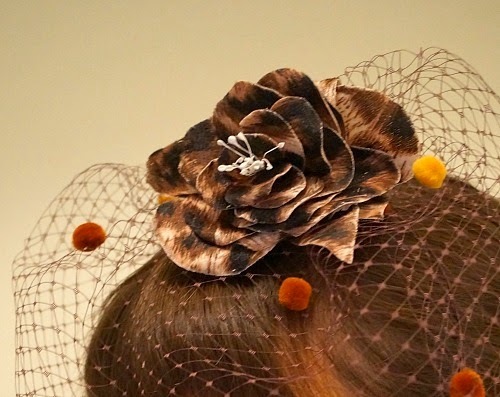 I loved the idea of making a leopard-print flower, and wanted to experiment with using different fabrics with this hand-made flower technique I learned at the last International Millinery Forum, in a class taught by Serena Lindeman. I managed to find a leopard-print top in an op-shop (don't worry, it was ugly) and here is the result! 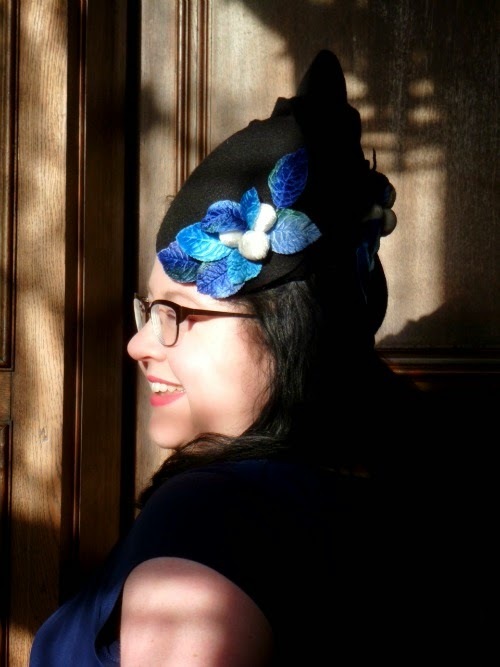 Adelaide, the travelling hat, is visiting in the United Kingdom again, and has recently been with Kate-Em, of the blog What Kate-Em did next. Kate-Em took these lovely photos on a weekend away in Lincolnshire. Check out the rest of the photos on her blog. They are gorgeous. I love the outfit Kate-Em chose to pair the hat with, and I love that she took some photos of the back of the hat too! 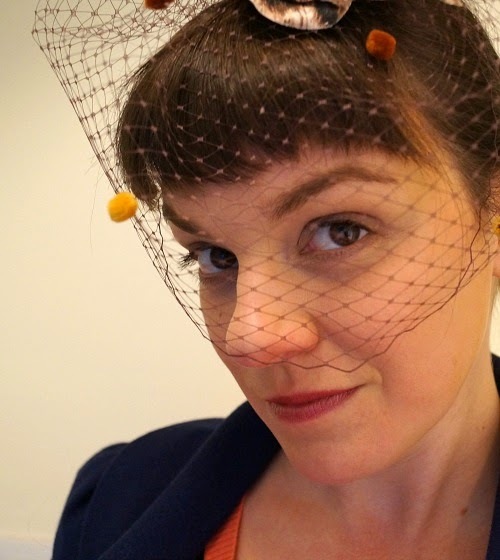 If you aren't following her already, Kate-Em's blog features a lot of amazing vintage knitting, some of which is also available in her etsy store, and she has recently joined instagram too. Today I'm bringing you the first of new type of post, which I hope to do more of in the future. I'm focusing on a particular hat style again, but this time, on inspiration for styling outfits that suit the hat style. The hat of choice for today is a boater hat. A vintage style popular from the 19th century onwards, these hats feature a flat crown and small-medium brim, and are usually made from straw. 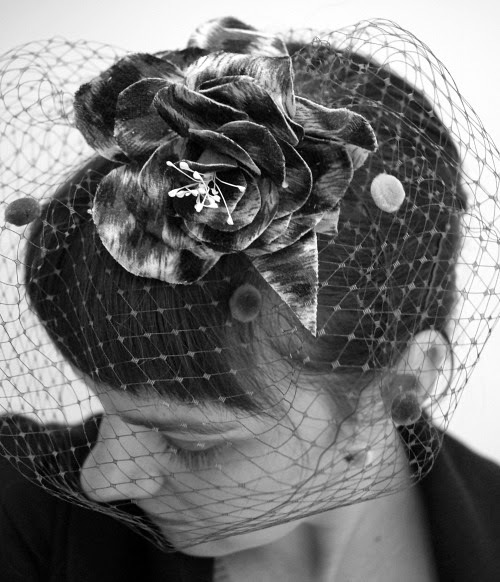 When worn by a woman, this style of hat was more traditionally called a sailor hat, and (like most hat styles) the feminine versions are often more varied. These days, we tend to use boater regardless of gender. 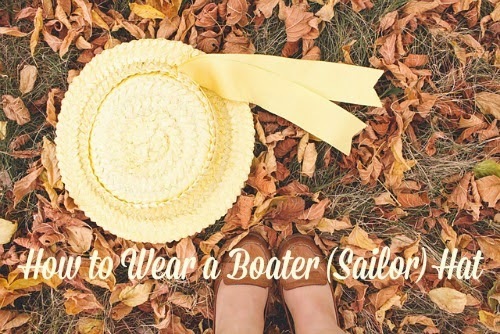 I've scoured the internet (ok, Pinterest) for some great looks that feature boater hats. 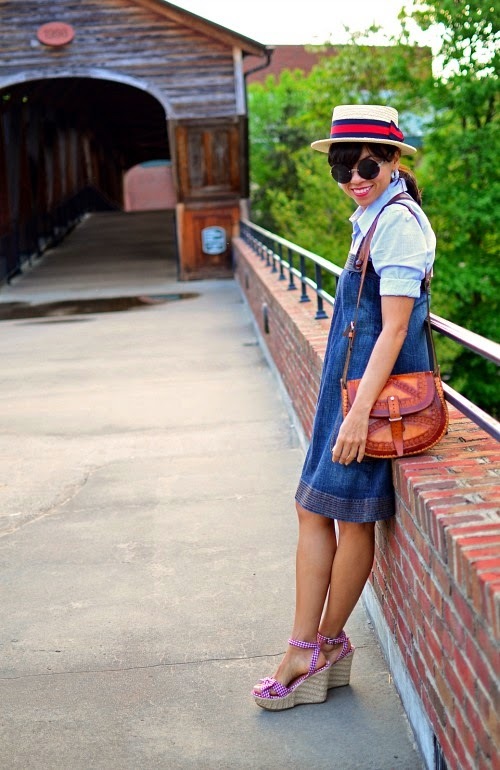 I'm bringing you the best photos from some stylish bloggers who wear a boater really well. All the images are copyright to the bloggers, used here with their permission, and each one links back to the blog post about that outfit (with more photos!). Boater hats make me think of summer and associated activities, particularly boating (obviously) or riverside picnics, so I love them with slightly nautical colour schemes, and bright colourful summer dresses. I also think of Edwardian silhouettes, and Eton schoolboys. To me, boaters are unquestionably cheerful and fun, and just made for sunny days. We start with Bonita from Lavender and Twill. 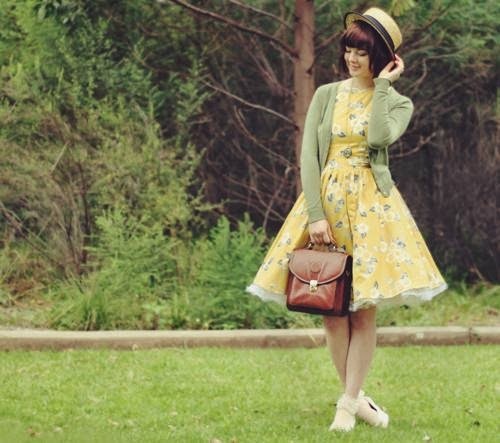 She recently purchased this vintage yellow boater and this charming photo is from her first outfit post to feature the hat. This soft pastel colour suits Bonita's signature style so well. It tops off a beautiful summery look (although I suppose it is clearly autumn in the photo!) 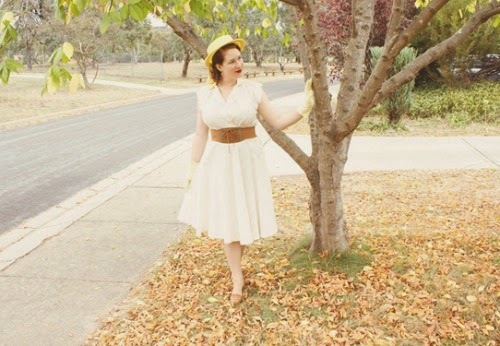 with such light bright colours and perfect vintage style. 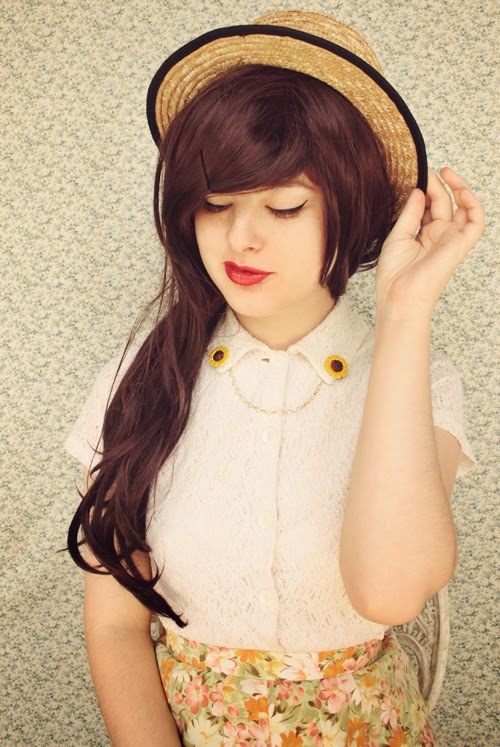 Carelia of the blog My Small Wardrobe has worn her traditional straw boater for a range of Fourth of July outfits in classic red-white-and-blue colours, that are echoed in the colours of the hat itself. She pairs her boater with outfits that clearly speak to me of summer celebrations, and include elements of classic style, but are unique and modern. 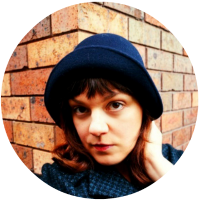 Annika, who shares outfit posts, DIYs and science facts at The Pineneedle Collective, has worn her boater hat with a wide variety of looks. They are all cheerful, cute and feminine. 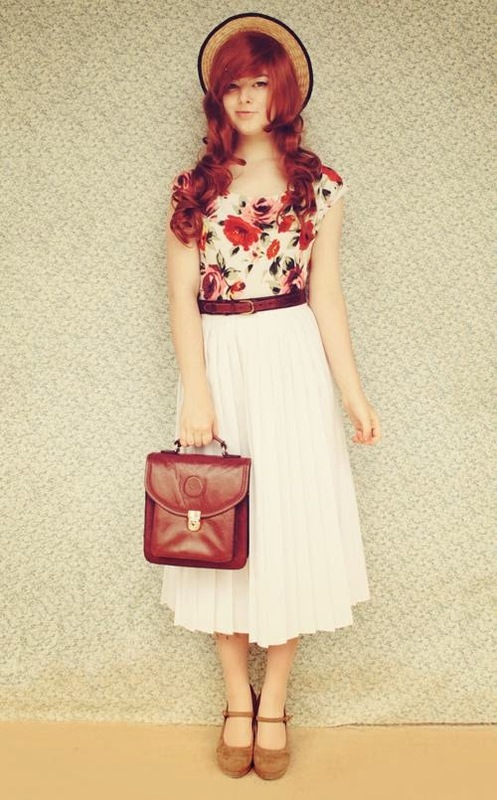 I've selected some of her more vintage-style looks to share, but it was really hard to choose my favourites! I seem to have gravitated towards the paler colours and florals here. Valentine, who blogs at Hello It's Valentine, brings us some more florals, but also navy and stripes. This bike! I've never seen anything like it. I'm a bit obsessed with outfit photos featuring bikes, possibly because I can barely ride one, and idealise the life that bike-riders have. I think this photo below is still my favourite of all the boater outfits I've found! Just perfect. So we've got boaters with skirts, dresses, pants, and shorts; with bold primary colours, classic neutrals and soft pale shades; and all the touches of riverboats and picnics that my heart desires! And they show to perfection how well a boater can be worn at all angles - flat on top of the head, angled to the side, to the front, or on the back of the head. Want more? Check out the rest of the images on my Pinterest board for How to Wear a Boater/Sailor Hat, and the rest of the great outfits posts from Lavender and Twill, My Small Wardrobe, The Pineneedle Collective, and Hello It's Valentine. 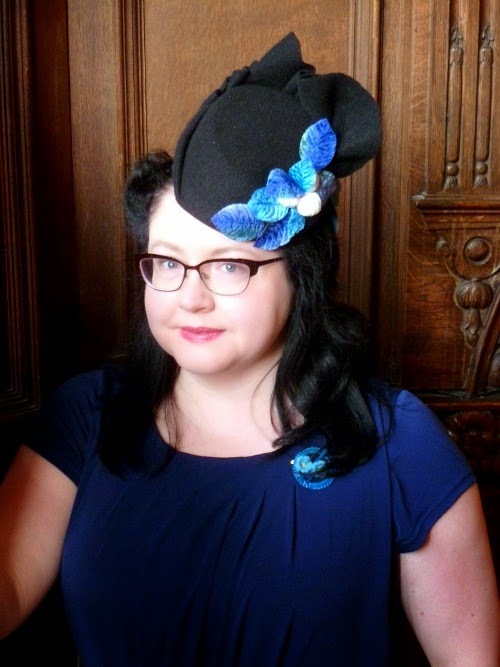 To keep up with the "How to Wear..." series and other hat-related content, sign up to the email newsletter. 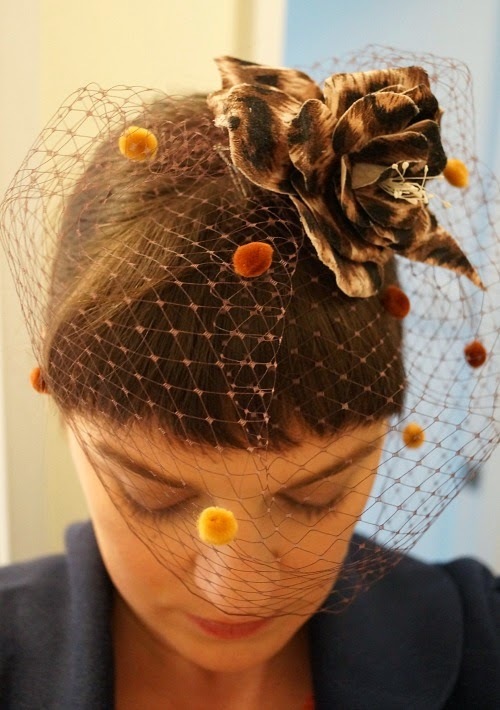 I'd love to know what styles of hat you would enjoy a "how to wear" post about, so please tell me in the comments!